Unlike most entertainers, Alan Jackson is a quiet, reserved man who can be uncomfortable with public attention and the media spotlight. However, watch him in concert, or listen to his recordings, and it becomes clear that Jackson loves country music. He admires country music’s heroes, and he relates to country music’s fans. He loves what country songs express. He loves the subtle emotions that the best country songwriters weave into lyrics. He loves getting on a concert stage, or settling into a recording booth, and turning his personal values and experiences into songs packed with wit, insight, and universal truths. During an era of tremendous musical change, Jackson built his reputation by being a steadfast standard-bearer for traditional country music. While others stoked debates about what does or does not constitute country music, Jackson provided the measuring stick. No one ever questioned the music Jackson created. His songs are, and always have been, the very definition of country music. That dedication to the genre’s core values was apparent from the start of Jackson’s recording career, in 1989, when he became the first country artist signed to Arista Records. His expressive baritone revealed the influence of heroes George Jones and Hank Williams, and his songwriting presented a clever, heartfelt view of life, love, and family in the South. On early hits such as “Here in the Real World,” “Chasin’ that Neon Rainbow,” and his first #1, “I’d Love You All Over Again,” Jackson sounded like a throwback to an earlier era. Nonetheless, within traditional country parameters, Jackson has explored a wide range of regional styles. His songs have drawn on bluegrass, Cajun, honky-tonk, gospel, love ballads, tear-in-your-beer heartbreakers, and western swing. He has proven masterful at finding fresh ways to update traditional styles while focusing on lyrics that tell his stories and extol his values and indulge his humor. The Newnan, Georgia, native was born on October 17, 1958. His father, Joseph Eugene “Daddy Gene” Jackson, worked as a mechanic at a Ford Motor Company assembly plant. His mother, Ruth “Mama Ruth” Musick Jackson, was a dietitian and school cafeteria manager. As Jackson paid tribute in his song “Home,” his father built the family’s residence around a one-room toolshed, expanding the home through the years to accommodate the births of Alan and his four older sisters. Jackson met his wife, Denise, at age seventeen; the couple married the following year. In 1980, after attending a country concert, Jackson began to talk to his wife about his interest in a career in music. Three years later, he started performing cover tunes with local country bands. He honed a distinctive style built on an expressive, believable baritone voice and songwriting that drew on his own experiences. Jackson turned those details into concise, catchy songs that were, by turns, colorful and deeply emotional. Denise Jackson, while working as a flight attendant, met singer Glen Campbell in an airport and asked for advice for her husband. Campbell referred her to a Nashville music publishing company he owned; he also told her that the couple should move to Nashville. In 1985, the couple followed Campbell’s suggestion and moved into a basement apartment in the Donelson neighborhood, near the Nashville airport. Jackson began working in the mailroom at The Nashville Network, a cable TV channel, and he picked up extra money singing demo recordings for songs written by other songwriters. He dedicated himself to writing his own material, which landed him a songwriting deal with Campbell’s publishing company, KayTeeKay Music. Jackson began recording his own songs in 1988 with the help of producer Keith Stegall. Those demo recordings led Jackson to his contract with Arista and the release of his 1990 debut album, Here in the Real World—co-produced by Stegall and Scott Hendricks—which sold two million copies. Every album Jackson released for the next fifteen years, all produced by Stegall, sold a million or more copies. After the terrorist attacks of September 11, 2001, Jackson wrote and recorded “Where Were You (When the World Stopped Turning).” He introduced the song at the 2001 CMA Awards, and it grew into a #1 hit that received national attention. Jackson has sold more than sixty million albums worldwide and ranks as one of the ten best-selling solo artists of all-time in any genre. As of 2017, he has registered fifty Top Ten hits and thirty-five #1s (including twenty-six Billboard #1s). He has received eighteen Academy of Country Music awards, sixteen Country Music Association awards, and a pair of Grammys. Jackson received the first-ever ASCAP Heritage Award in 2014, having earned the title of most-performed country music songwriter-artist of ASCAP’s first one hundred years. Jackson is a member of the Nashville Songwriters Hall of Fame and the Grand Ole Opry. Jackson became the first country artist ever to earn RIAA Gold certification for two Digital Singles (signifying 100,000 purchased downloads) with the success of "It's Five O’Clock Somewhere" and "Remember When." In response to Hurricane Katrina, Jackson participated in multiple benefit concerts, including the televised Country Reaches Out: An Opry Benefit for the American Red Cross, and the mammoth, multi-genre ReAct Now: Music & Relief MTV concert event. To further hurricane relief, Jackson teamed with the American Red Cross for a national PSA, in addition to becoming the face and voice of the regional "Thanks, Nashville" campaign. The release of Precious Memories was accompanied by a corresponding concert special which aired on GAC and was taped live at the Ryman Auditorium. In June, the DVD, Precious Memories – Live at the Ryman, was released. Precious Memories was certified Gold and Platinum in August and became the only Platinum-certified country gospel disc by a solo artist in SoundScan history. Precious Memories became the only gospel recording in history to debut at #1 on Billboard’s Top Country Albums chart, and Jackson became the first country artist ever to debut an album of all -spiritual material at #1 on the Top Christian Albums and Top Christian & Gospel Albums charts, and the first artist ever to top all three charts at once. In September, Like Red on a Rose became Jackson’s sixteenth album release and first produced by Alison Krauss. Like Red on a Rose certified Gold. In April, Precious Memories was named Country Album of the Year at the 38th Annual GMA Dove Awards. From May through October, Jackson embarked on a 30-date co-headlining tour with Brooks & Dunn. "A Woman's Love," from Like Red on a Rose, became Jackson's 45th Top 5 single. Jackson shared honors as the Nashville Songwriters Association International's 2007 Songwriter/Artist of the Year. Jackson recorded the songs "It's All About Him" and "That's the Way" exclusively for wife Denise's best-selling memoir, It's All About Him. The most-nominated artist in CMA history, Jackson earned his 75th career CMA Award nomination for Hey, Good Lookin'," a Vocal Event collaboration with George Strait and Jimmy Buffett. The song was from the Jackson/Strait/Buffett concert album, Live at Texas Stadium, released earlier in the year. In November, Precious Memories was named Inspirational Country Album of the Year at the 13th Annual Inspirational Country Music Award Show. Released March 4, Good Time became Jackson's 17th album, containing 17 songs, and marking the first time in his career Jackson had been the sole writer on his entire album. Good Time became the fourth release of Alan's career to simultaneously debut at #1 on Billboard's pop and country album sales charts. The album's first single, "Small Town Southern Man," logged multiple weeks atop the country airplay charts and became Jackson's 32nd #1 single. In August, Jackson was honored at a celebration commemorating 50 million albums sold. "Good Time" became the second single - and second #1 - from the Good Time album. Earning four nominations for the 42nd Annual CMA Awards, Jackson extended his lead as the all-time most nominated artist in CMA history, with 79 career nominations. In October, he was named ASCAP Songwriter/Artist of the Year, recognizing the success of "A Woman's Love" and "Small Town Southern Man." Jackson was celebrated by a host of country's finest artists as his music and career became the focus of an edition of CMT Giants. Jackson topped the charts with “Country Boy,” the third #1 single in a row from his smash Good Time album.In June, Jackson celebrated his 20-year career anniversary with a free concert for fans in downtown Nashville. In June, Jackson embarked on his first-ever Scandinavian tour, performing in Norway, Sweden & Denmark. In July, CMT premieres the Jackson concert special, Aquapalooza on Lake Martin. In January, Jackson gives fans a glimpse into his next albumFreight Train with the release of “It’s Just That Way,” the first single from the March 30 album. In February, Mattie Jackson, Jackson’s eldest daughter, writes the treatment for “It’s Just That Way” video, directed by Roman White. Good Time is Certified Platinum by the RIAA and becomes Jackson’s 15th career platinum award. On April 16, Jackson was immortalized in entertainment history when he was presented with a star on the Hollywood Walk of Fame. Alan recorded “As She’s Walking Away” with the Zac Brown Band – the song went on to top the country charts in November, and Alan and the group performed it on the CMA Awards. On November 23, 34 Number Ones – a collection containing all of Alan’s chart-topping hits, as well as “As She’s Walking Away” and two more songs – was released. Alan wins a Grammy Award for “As She’s Walking Away” with the Zac Brown Band. In March, Alan embarks on his first-ever tour of Australia, which sold out in just hours when tickets were placed on sale a few months earlier. Alan opens a new career chapter by entering into a joint venture to record and release new music with Capitol/EMI Records Nashville. 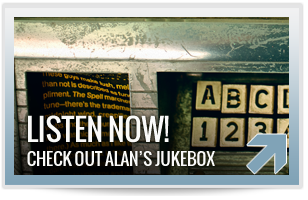 Alan releases “Long Way to Go,” the first single from a new album due in the fall of 2012! Alan earns his 80th CMA Award nomination (with the Zac Brown Band for “As She’s Walking Away”). Alan performs “Where Were You (When the World Stopped Turning)” in front of a crowd that includes President Barack Obama, Vice President Joe Biden and their wives at a 10th anniversary remembrance event in at the Kennedy Center in Washington, DC. Alan is inducted to the Nashville Songwriters Hall of Fame. Alan receives a star on Nashville’s Music City Walk of Fame. Draws 6,000 fans for Music for Mineral, a benefit concert raising over $150,000 for the city of Mineral, VA, small town at the epicenter of a rare east coast earthquake. Headlines fifth annual Stars Go Blue concert benefitting the Colon Cancer Alliance at historic Ryman Auditorium. Daughter, Ali Jackson stars in video for “Blue Ridge Mountain Song”, with a sweet young love storyline filmed east of Nashville and in the hills of North Carolina. Sony Legacy releases first ever box set, Genuine: The Alan Jackson Story, a compilation celebrating Alan's years on Arista Nashville. The man from rural Newnan, GA, who claims he is just a “singer of simple songs,” has sold nearly 60-million albums worldwide and ranks as one of the 10 best-selling male vocalists of all-time in all genres. He has released more than 60 singles – registering 50 Top Ten hits and 35 #1s (including 26 Billboard chart-toppers). He has earned more than 150 music industry awards – including 18 Academy of Country Music Awards, 16 Country Music Association Awards, a pair of Grammys and ASCAP’s Founders and Golden Note Awards. Jackson received the first-ever ASCAP Heritage Award in 2014 having earned the title of most-performed country music songwriter-artist of ASCAP’s first 100 years. He is a member of the Nashville Songwriters Hall of Fame and the Grand Ole Opry. Alan Jackson is one of the most successful and respected singer-songwriters in music. He is in the elite company of Paul McCartney and John Lennon among songwriters who’ve written more than 20 songs that they’ve recorded and taken to the top of the charts. Jackson is one of the best-selling artists since the inception of SoundScan, ranking alongside the likes of Eminem and Metallica.